Turquoise Jewelry has been made worldwide for, literally, thousands of years. In fact, the Cairo Museum in Cairo, Egypt has Silver Turquoise Jewelry carbon dated prior to 5,500 B.C. Native American Indians have made Sterling Turquoise Jewelry with beads for well over a thousand years and Silver Turquoise Jewelry began with the Navajo Indians of the American Southwest around 1870. American Turquoise Jewelry was well accepted by the American public shortly after the Navajo Indians started creating their Silver Turquoise Jewelry designs. It is believed Indian Traders first took Native American Indian Sterling Silver Turquoise Jewelry to the booming Southern California by the 1880's and it was well accepted there. By the mid 1890's, the Grand Canyon had become well exposed by President Roosevelt and the Railroad was in full swing. Tourist came to the Southwest and took silver Turquoise Jewelry made by the Native American Indians home with them as their favored souvenir from the American Southwest and the Grand Canyon. 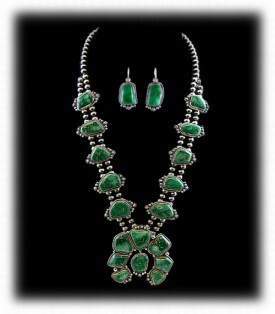 There have been several Silver Turquoise Jewelry booms since its introduction to the American public in the 1800's. The biggest Turquoise Jewelry boom was in the 1970's as many major publications including Arizona Highways spurred a tremendous amount of interest by the public for this beautiful and Native American handcrafted art. Today, Silver Turquoise Jewelry is made, primarily, in the Southwestern U.S. by Native American Indians (Navajo and Zuni), Contemporary Anglo and Hispanic) Artists and Sterling Silver Turquoise Jewelry Manufacturer Shops located throughout Arizona, New Mexico and Colorado. The quality and design of American Sterling Turquoise Jewelry varies significantly from the above group of producers. There are many different types of markets for Turquoise Jewelry, from high quality pieces with spectacularly beautiful Turquoise Stones and exquisite silver work all the way down to Turquoise Costume Jewelry sold in department Stores, Boutique Shops and Television Marketing Shows. Really, there is Silver Turquoise Jewelry Rings, Pendants, Bracelets, Earrings and more for every type of person with most any lifestyle. Durango Silver Company of Durango, Colorado USA has been producing some of the finest quality Silver Turquoise Jewelry coming out of the Southwest for nearly 40 years. We specialize in Turquoise Jewelry with Gemstone quality Turquoise and silver work that meets higher standards than most other companies. Another specialty of Durango Silver Company is rare American Turquoise from Turquoise Mines that have been out of production for one reason or another. 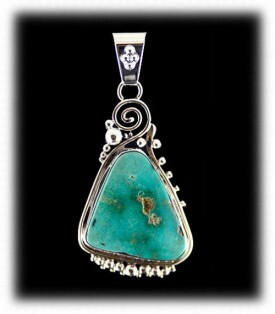 Below are some examples of Silver Turquoise Jewelry to give you a quick education. 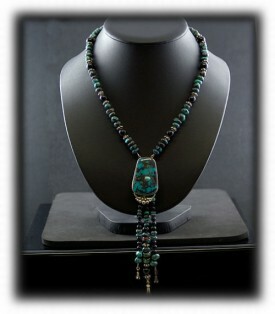 We have included photos of different silver Turquoise Jewelry items along with detailed descriptions of each piece. Please scroll down to see the difference between blue Turquoise Jewelry, Green Turquoise Jewelry, Navajo, Zuni and Contemporary Turquoise Jewelry. 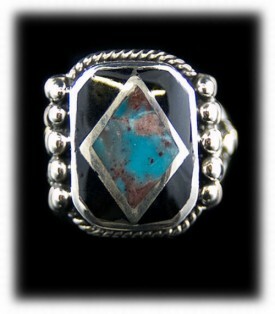 This is a Mens Turquoise Ring and is a good example of Bisbee Blue Turquoise Jewelry. Bisbee Blue Turquoise came from Bisbee, Arizona from the 1950's to the mid 1970's. 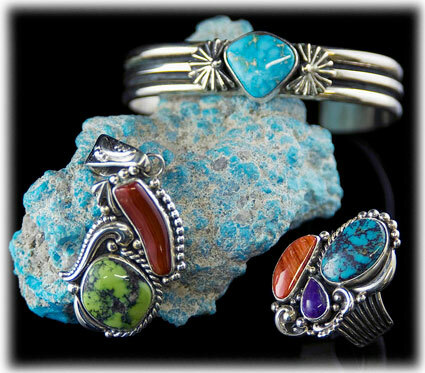 Silver Turquoise Jewelry and Mens Turquoise Rings are seldom scene with Bisbee Blue Turquoise. Durango Silver Company has one of the largest collections of Bisbee Turquoise in the United States and we make a lot of Silver Turquoise Jewelry with it, check out our online store often if you are a fan of Bisbee Turquoise. This is a beautiful Womens Turquoise Ring with Spider webbed Tortoise Turquoise. This Tortoise Turquoise Womens Ring was produced by Durango Silver Company. 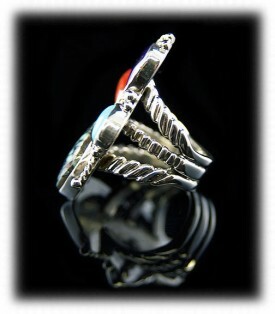 It has a wide ring shank stamped with a fan design and the stones is bezel set. We produce a lot of simplistic bezel set Turquoise Rings with fancy ring shanks such as this one and Womens Turquoise Rings are a specialty of our company. We own the Tortoise Turquoise Mine and make a lot of Silver Turquoise Rings with it, visit our store often to see the new items as they become available. This Sterling Turquoise Ring is unique as it has multiple Gemstones - Tortoise Turquoise, Sleeping Beauty Turquoise, Coral and Sugilite. Many people like Blue Turquoise Jewelry and many like green, however, they look great together in multi gemstones Turquoise Rings. This Silver Turquoise Ring was made by John Hartman and is considered by him a Victorian Style Silver Turquoise Jewelry design. The silver work is intense and very unique. 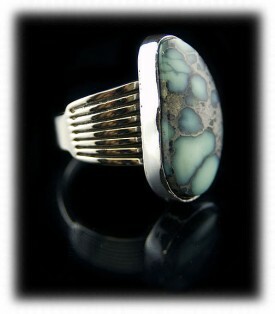 Silver Turquoise Rings by John Hartman are only sold through Durango Silver Company. These two Silver Turquoise Pendants were produced by Durango Silver Company. For those who like Blue Turquoise Jewelry the one on the left was made with Blue Gem Turquoise. Tonopah Blue Gem Turquoise was mined from about 1950 to 1975 and is known for its beautiful array of colors ranging from blue to green with pretty golden brown matrix. Battle Mountain Blue Gem Turquoise is bright to almost shocking blue and is awesome in Blue Turquoise Jewelry. The Turquoise Pendant on the right is Navajo handcrafted with hand stamped silver work. 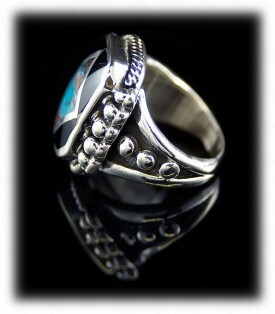 It has a Manassa Turquoise Stone and is a classic example of Navajo Sterling Silver Turquoise Jewelry. Here is a Sterling Turquoise Pendant and a Sterling Turquoise Pendant on Sugilite, Onyx and Sterling Silver Beads. Both of these Turquoise Pendants were made with Tortoise Turquoise from Nevada. For those who like Green Turquoise, Tortoise Turquoise runs from mint green to almost an emerald green. This mine also produces beautiful caramel and yellow colored Varisite that many people call Yellow Turquoise. Sterling Silver Turquoise Jewelry made with Tortoise Turquoise is unique and can be bought from Durango Silver Company. Durango Silver Co produces a lot of Fashion Turquoise Bead Necklaces and if you enjoy this type of Silver Turquoise Jewelry, you must visit our site often to see this great Jewelry as it is made by Nattarika. 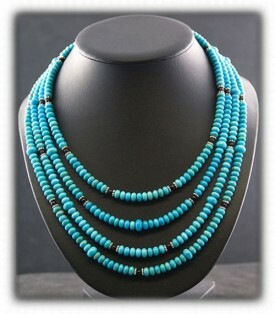 Fashion Turquoise Beads are one of our specialties. Nattarika makes outstanding Turquoise Bead Necklaces from hand picked select Turquoise Beads that we have been collecting for nearly 40 years. Fashion Turquoise Jewelry is her specialty and she uses a lot of colored Gemstones along with Turquoise to create our line of Fashion Turquoise Jewelry unique to Durango Silver Company. 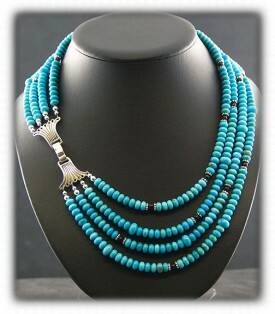 Here is a classic Navajo Squash Blossom Necklace made with Manassa Turquoise. The Navajo Indians have been making Squash Blossom Necklaces for about 100 years, at this point they have become timeless in the fashion Turquoise Jewelry market. The Fashion Turquoise Bead Necklace on the right with a unique combination of Sterling and Turquoise. John Hartman did the Silver work and then Nattarika put her finishing touches on it to make it a stunning piece of Fashion Silver Turquoise Jewelry. 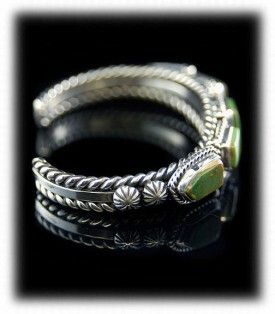 This Inlay Turquoise Bracelet was produced by Durango Silver Company. Each stone is individually inlaid into channels/voids in the silver and then sanded back off flush to the metal. Many people like Inlay Turquoise Jewelry as it is sleek and smooth. 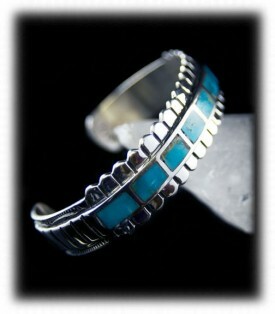 We make Inlay Turquoise Rings, Turquoise Silver Bracelets, Earrings and more. 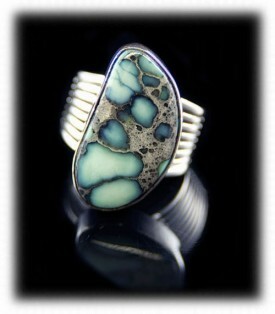 We Inlay with Natural American Turquoise that is not found by many other silver Turquoise Jewelry companies. 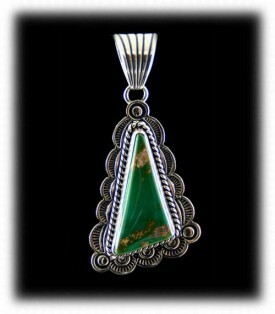 Visit our online store to find a wide array of Inlay Turquoise Jewelry. Silver Turquoise Bracelets produced by Durango Silver Company are only sold through our Online Store and our Trading Post in Durango. 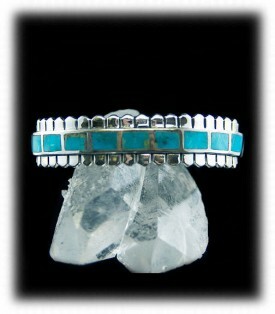 This is a classic Silver Turquoise Bracelet, called a "Navajo Row Bracelet" made with Manassa Turquoise. Manassa Turquoise is from Colorado and was one of the first Turquoise deposits found by American Indians over a thousand years ago. Silver Turquoise Bracelets made with Manassa Turquoise are fairly scarce as the mine has been out of production for many years. Durango Silver Company has the Bill King (owner of the Manassa Turquoise Mine) Manassa Turquoise collection which is great for people who collect specialty Silver Turquoise Bracelets. 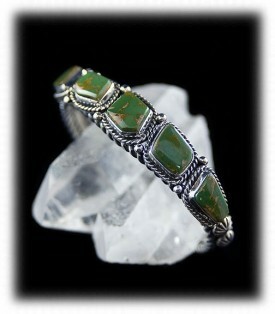 The silver Turquoise bracelets above are wonderful examples of silver Turquoise jewelry. 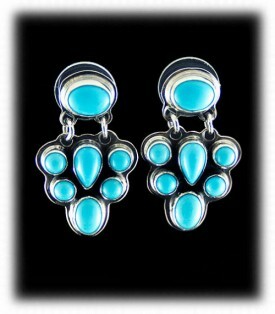 Here are two beautiful pairs of Silver Turquoise Earrings. The pair Silver Turquoise Earrings on the left were Navajo handcrafted with Sleeping Beauty Turquoise Stones in a cluster design. 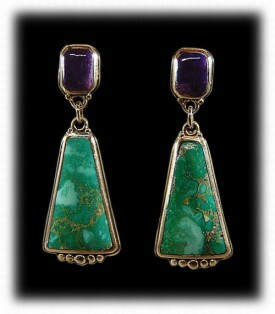 On the right is a pair of bezel set Silver Turquoise Earrings with Nevada Green Turquoise and Sugilite Gemstones. Durango Silver Co produces many different Silver Turquoise Jewelry Earring styles and is continuously coming up with new Fashion Silver Turquoise Jewelry to add to our collection that we offer. We invite you to visit our online store often to see the new Fashion Silver Turquoise Jewelry items that we add to our site daily. We also produce a Newsletter that we send out via email occasionally. This publication has information and photos of our newest creations and interesting Turquoise Jewelry facts that many people like to read. 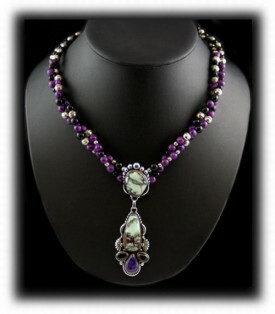 We also have a monthly drawing for Free Turquoise Jewelry that we give away to our members. Join our Newsletter by signing up below. Thank you for reading our presentation page on Turquoise and Silver Jewelry, we hope you learned something about Silver Turquoise Jewelry.